Many complain, and I am one of the complainants, that some movie or the other was too long and that the story could have been unfolded in much lesser time. In most cases, it does happen. However, some movies, like Asif Kapadia’s ALI and NINO should have been extended to another half an hour at least to let the viewer have more time to understand the relationship between its lead characters, as well as the cultural aspect of the film. But unfortunately, all what we get is a movie without a proper beginning and illogical ending that will eventually answer your question of why many don’t even talk about it. 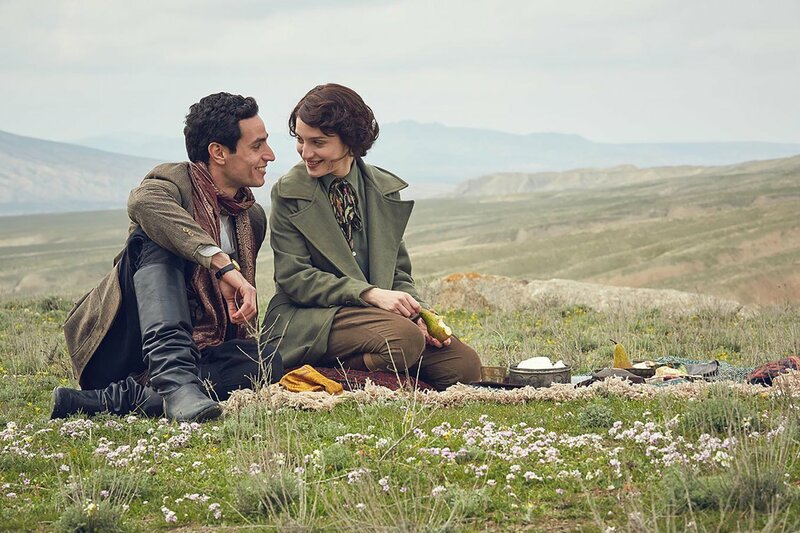 Kurban Said’s novel ALI and Nino follows the love story of Muslim boy Ali and a Christian girl from Georgia, Nino Kipiani, on the backdrop being the war for Azerbaijani Independence that would be reclaimed only 71 years later. But the two will find obstacles on their way to eternal happiness, that will eventually will turn into one, but not in the way Ali and Nino were expecting…. Ali Khan is from Baku and belongs to an extremely wealthy family whose financial security would only increase every day. Nino is a Georgian Princess whose family is also well known in Georgia. When the movie begins, we already find Ali and Nino in love with each other. Soon Ali meets Nino’s father, Duke Kipiani (Mandy Patinkin) who refuses to allow Ali to marry his daughter. Ali’s friend from the neighborhood country Armenia, Malik offers Ali to talk to the Duke Kipiani and help him understand that the marriage between Ali and Nino could have benefited both sides, but he is actually secretly in love with Nino. Malik keeps his promise to talk to the Duke, but the message he delivers strengthens Duke’s position to not allow two people from two different religions to tie the knot. As an acknowledgment and act of gratitude, the Duke closes his eyes when Malik kidnaps Nino to marry her. But that was just the beginning of endless challenges for Ali and Nino to overcome not only the prejudices of society, but a war as well, that usually takes more lives than retains them. There was a weird feeling while watching Asif Kapadia’s movie. It felt like the director had no control over the film, and as it if it were directed by a shadow filmmaker, who decided to remain unknown. Having a wonderful story that could have earn many hearts, ALI and NINO ends up as a dull movie that had no heart, soul or whatsoever. Despite the book itself containing an emotional tide of Ali and Nino on their well deserved happiness, Kapadia’s movie does nothing to trigger any emotions or sympathy towards its lead characters, which was truly unfortunate. This is why by avoiding this film would be considered a great favor to Kapadia, to forget once and for all that this movie was ever made.